Education should anticipate diversity and seek to provide the best experience for as many students as possible. At EF Academy everything from accommodation, facilities, activities, to classrooms, teaching, and study programs are designed with the individual student in mind. Here are three ways we tailor our learning environment to each child’s unique strengths, passions, and aspirations. “My class is very student-centered, and I usually use the Socratic Method or the Harkness Method, which is really based on the students’ discussions and inquiries. It’s a back and forth between them, and I facilitate. I also use group activity where students collaborate and support one another. I offer extra help too, where I’ll work with a student individually. I try to do so in class as well because it’s important for students to receive individual attention. I’m constantly checking their level of understanding; if they don’t understand, then the lesson completely changes so that I make sure that they get it”. “I did an internship over the summer at a cosmetics company in Brazil. I fell in love with the entire process of creating a cosmetics product, and so I thought why not continue that in my school? So, this year I started The Soap Club. I tried to combine all of my interests together so cosmetics, chemistry and also art because all of the members of my club create their own designs. It was awesome going through the whole process from research to creation, and it was helpful because it gave me an idea of how it would be to pursue a career in cosmetics product development”. “Its main goal is to create meaningful connections through experiential learning. At each landmark, the students were able to see, touch, and experience the rich diversity and history that is New York City. Stationed at each location was a member of the Academic Leadership Team, there to help guide and teach students about the intricacies of these famous places”. “The actors moved us along as they performed, so each scene took place in a new part of the cavern. The students, all of them English learners, watched excitedly. It was magical. 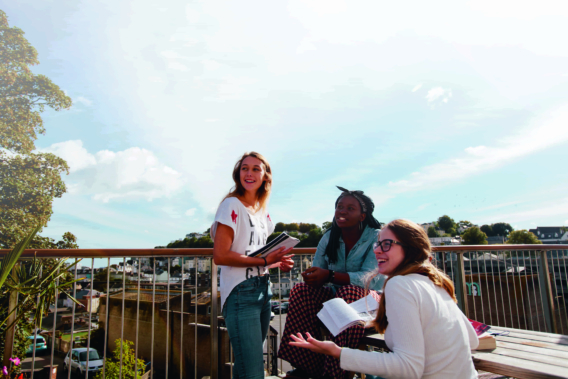 What’s more, it demonstrated how our location here in Torquay provides us with some unique opportunities”. In a recent article written by Proud Siwanarak, a student from our Oxford campus, a trip to the University of Oxford’s Botanical Garden is described as being ‘An outdoor classroom’. Whether in the classroom or outside of it, EF Academy recognizes that education should be a varied, rich, life learning process. We’re dedicated to setting every student on the right pathway towards success.